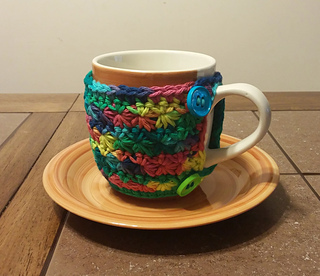 This is a contribution pattern to Cre8tion Crochet, designed by Same DiNamics Crochet. 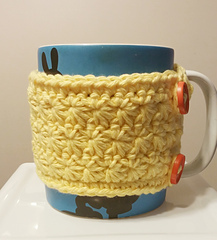 When my best friend asked me to make her a mug cozy for her to use while drinking coffee, I knew I had to make something special just for her. She is definitely a star and one of a kind. 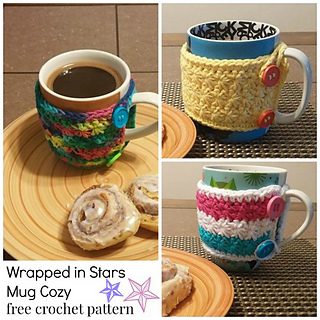 The mug cozy will protect your hands from the heat of a coffee or tea mug while offering a soft and comforting touch. You can use acrylic but keep in mind cotton works best for absorption. 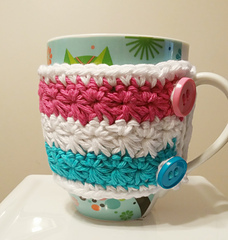 2 Buttons size 7/8; Needle for weaving in ends; Scissors.